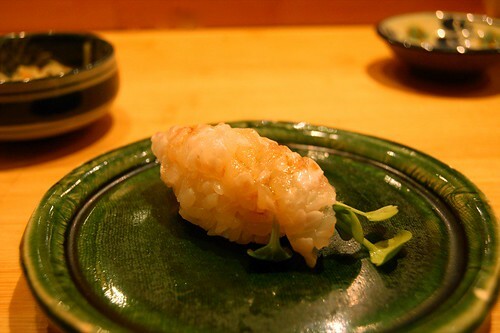 One of the standout meals from my summer in New York was dinner at Sushi Yasuda - I remember every piece of sushi distinctly, from my initial reaction down to the aftertaste. Time follows different rules at Yasuda, a combination of impatient anticipation for the next piece and tenaciously savoring and treasuring each bite. Each piece is so good that you grow attached and want more, but you know that good, if not better things are to come, so of course you move on. All the while you know that with each piece, the inevitable end to the meal is approaching, and you try in agony to prevent that by eating slower and mentally deducing the remaining pieces by process of elimination. 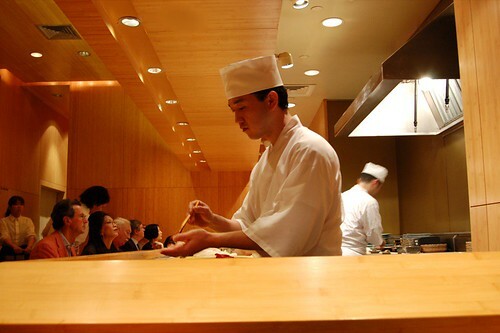 Dining at Sushi Yasuda is a tricky matter indeed. Since J and I were curious about trying everything, we automatically went with the omakase. Our chef asked if we didn't like anything. Nope, we replied. Did we like anything in particular? 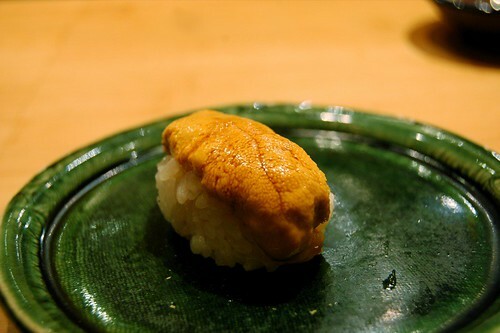 "Well, toro and uni are some of my favorite things (in life)." 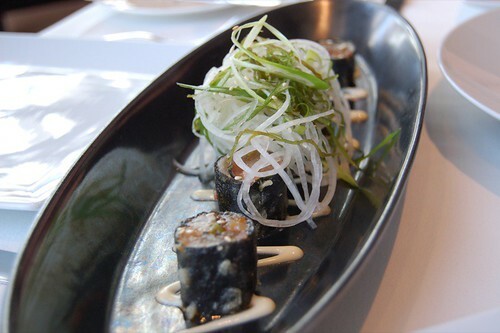 We started off with blue fin fatty tuna from Spain. 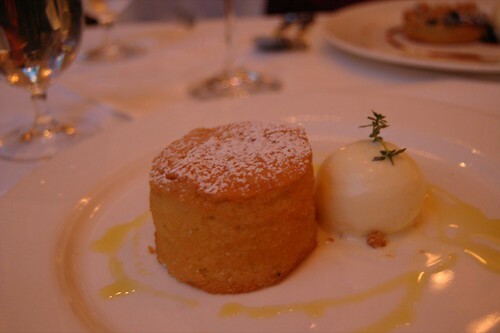 It was rich and buttery, yet so ethereal it melt in my mouth. 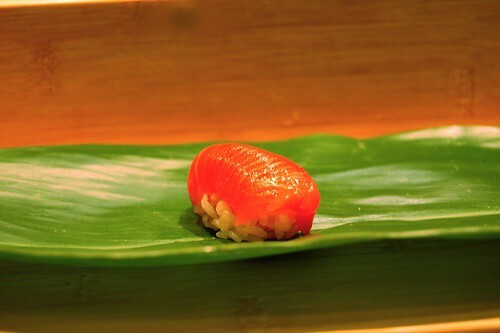 Complimenting the toro was the perfect ratio of rice, perhaps the best sushi rice I've had in the States. The consistency was just right, such that each grain was hard enough to be distinct to balance out the fish, yet delicate and light to accentuate the texture of the fish. 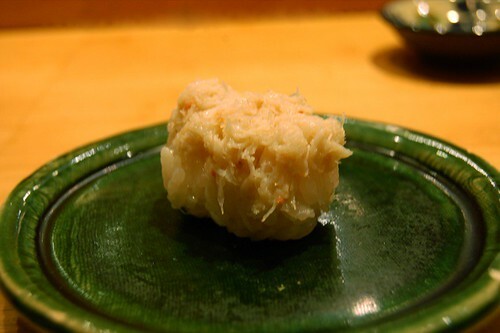 Perhaps the most complex and difficult part of making sushi is perfecting the rice. 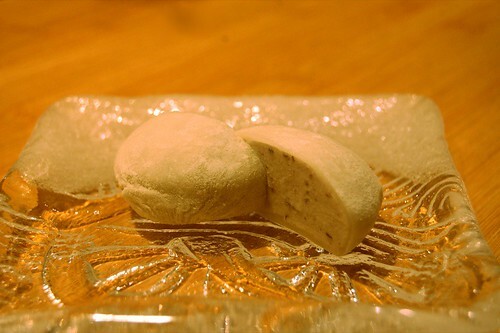 Yasuda uses a domestically grown mix of Japanese short and medium grain rice, combined with Japanese red and white rice vinegars, Japanese sea salt and small amount of sugar. The water has been purified with bincho-tan (Japanese charcoal). He cooks the rice in precise proportions at calculated temperatures for a specific time. Like a scientist in a lab, he has revised his method after years of research and experiment. Using his hands as an instrument, he evaluates how moist the rice is before cooking it. He adjusts the amount of water accordingly. 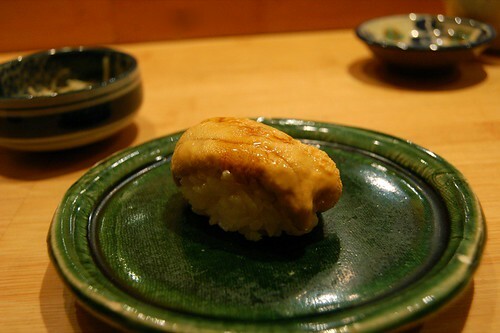 "Yasuda's rice is a revelation... Each grain is as eloquent as a haiku." Eloquent indeed. I too will try my hand at a haiku. 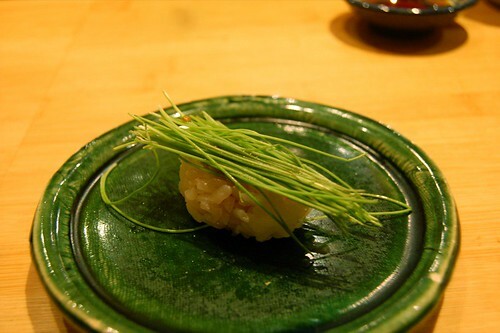 "The rice is cooked evenly, is subtly sweet and is the ideal "stickiness" to conform to the shape of the inside of Yasuda's hand. He applies six swift strokes and a delicate pressure to the rice to control the amount of space between the grains and to achieve the particular density, size and shape he deems suitable for the kind of fish or vegetable to be placed upon it." 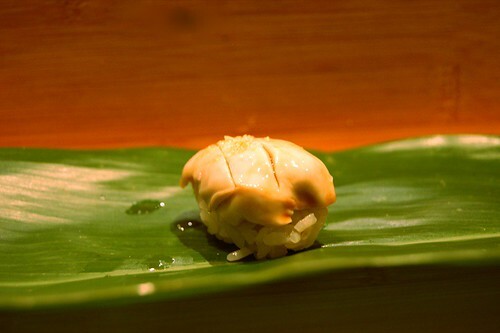 The oyster was fresh and delightfully briny, finished off with a few drops of lemon and sea salt. A very muscular cut, fibrous to the point of being very "meaty." 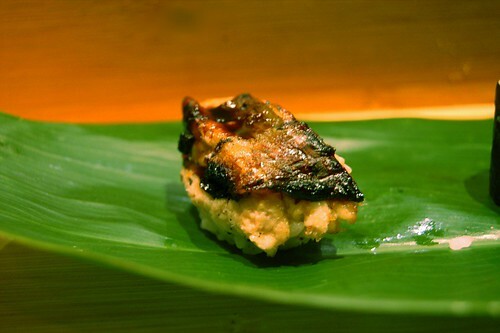 Lightly grilled and just sweet, this was some of the most delicate and smooth anago I've had. 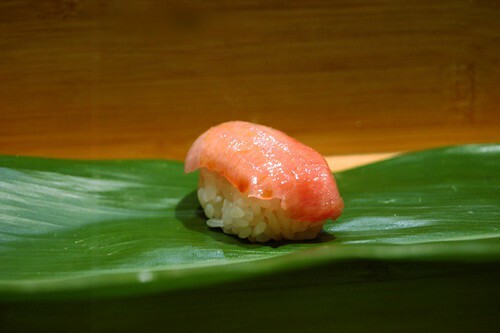 Similar to normal (red) king salmon, but fattier and also sweeter. This uni was simply incredible. Nutty, creamy, and buttery, it was finished off with a sprinkle of sea salt; it tasted like foie gras with a strange hint of mango flavor. Naturally, this would not be my last piece. 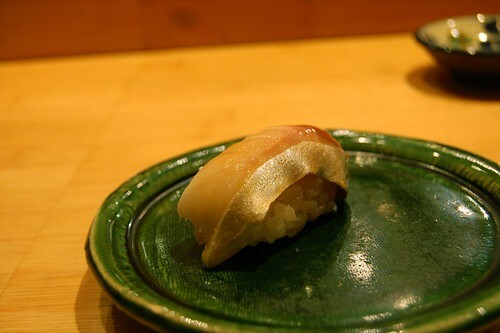 Mackerel is not my favorite of cuts, since I am often repelled by the sharp flavor. 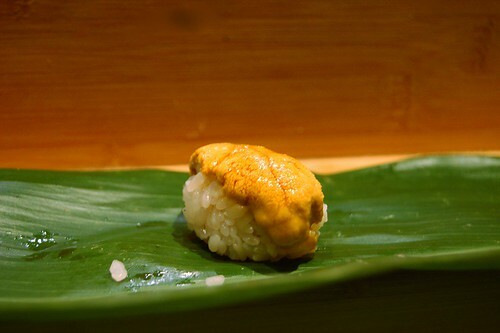 However, the taste of the mackerel was actually refreshing, even after just having the buttery uni. The toro was just as buttery as the earlier piece from Spain, and it was complimented perfectly with subtle scallion rolled inside crunchy nori. 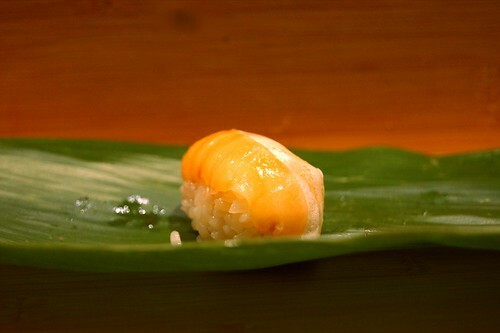 A little heavier than the anago, but delicate nonetheless. 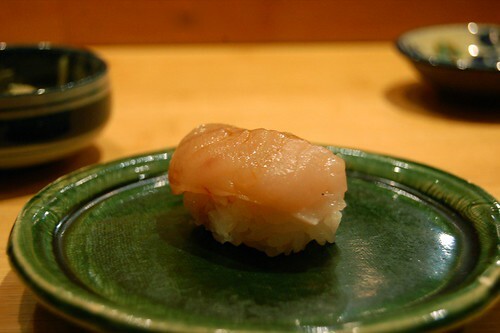 It was so light that it melted in my mouth, something pretty rare for a cooked fatty fish. 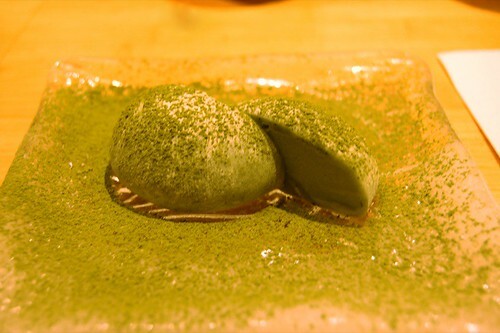 A palate cleanser of sorts, like taking a solid wheat grass shot (with Yasuda's perfect rice). Perhaps I should have one of these every morning with breakfast. Encore round. I just couldn't get enough. A fantastic meal that exceeded my already high expectations. It's like being transported to Japan for a few hours with access to the best fish being prepared before your eyes, minus the 16 hour flight, jet-lag, and fish-market smell. Yasuda-san, I will write haikus for you any day. In light of all the speculation surrounding Italian celebrity chef Mario Batali and his (non-renewed?) 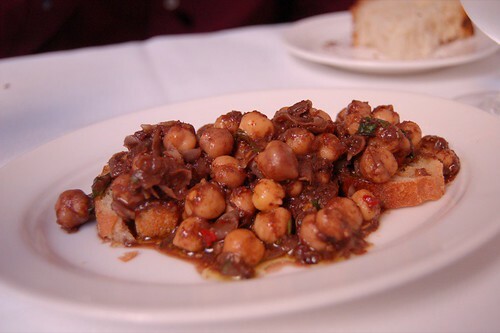 contract with the Food Network , I feel it apt to post about Babbo, Batali's flagship restaurant and one of the hardest to book restaurants in New York. I was quite prepared to battle it out for a table, having gone through a similar ordeal at Quince for, coincidentally, a meal of pasta. Surprisingly though, I called in, got through right away, and secured a reservation for a Tuesday night. 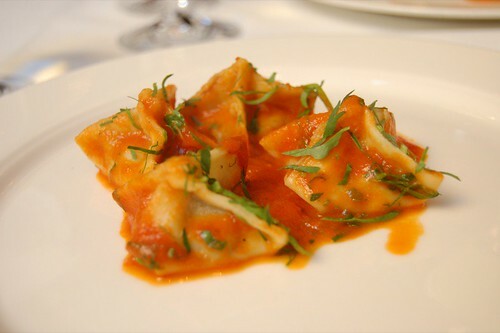 I was starving by the time 6 came around, and I became increasingly excited for a taste of Batali's pastas. The restaurant was already quite full when we arrived; we approached the maître d, a scholarly man who gave me vibes of a dusty library. 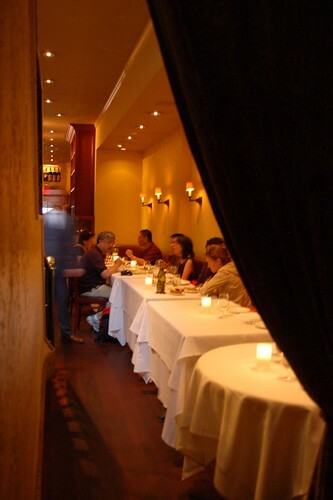 We were escorted to the upstairs dining room, a well-lit room with a dozen servers hovering around the wine bottles, ready to pour whenever someone took a sip. We proceeded to order the pasta tasting menu. The first course, a black tagliatelle was excellent. 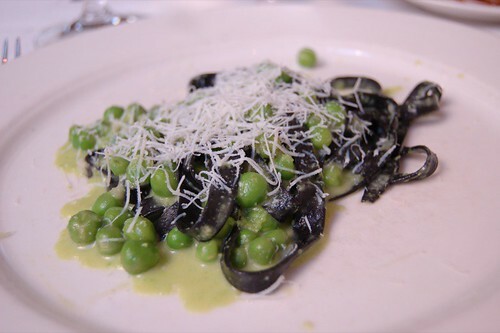 The pasta was perfectly al dente with a hearty, semi-rough texture, complimented by fresh spring sweet peas. It was topped off with shavings of pecorino, a sharp but unoffensive sheep's cheese that further brought out the sweetness of the peas. 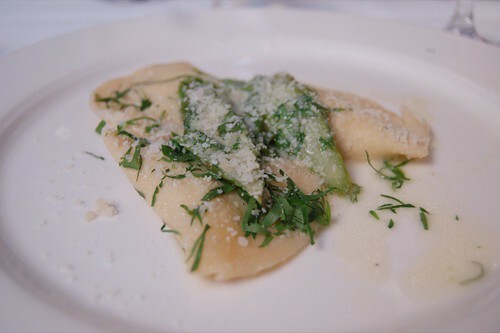 These stuffed halfmoon-shaped pastas were good, but nothing too outstanding. The al dente pasta was once again a nice texture, but I found the mezzalune a bit bland. They were stuffed with ricotta but merely accented with asparagus and basil. The dish quickly got repetitive; it became just another pasta and cheese dish. I got very excited when I saw Funghi on the menu, and even more so when I found out "trifolati" meant "truffled." However, I was probably more disappointed with this pasta than the others. The tubular pasta was inconsistent; some pieces were way undercooked, and extremely starchy. 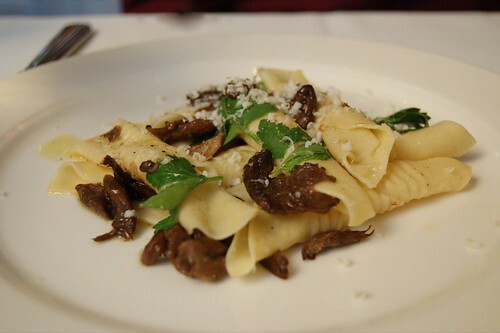 The mushrooms were fresh and a great flavor, but too salty, even when paired with the plain pasta. I'm not quite sure who Domingo is, but he makes a mean tomato sauce. The braised-beef in the stuffed pyramids, was a bit drier than I preferred; the real highlight of the dish, however, was the tomato reduction that was heavily comprised of the juice from a ripe summer tomato. A plain pasta with the passato would have been just perfect. 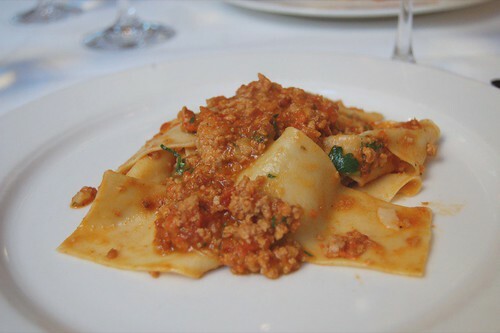 The final pasta was a pappardelle with a rich meat sauce. The pasta was a good texture, and the hearty sauce was juicy with an abundance of minced meat, aromatically spiced with basil and parsley. However, it was a bit too rich, having just finished the meaty pyramids. We were all just too full at this point for this entree-sized course, and it too became repetitive. 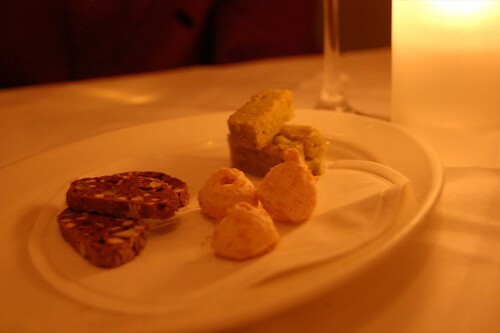 Surprisingly, Babbo's desserts fared much better than the entrees. 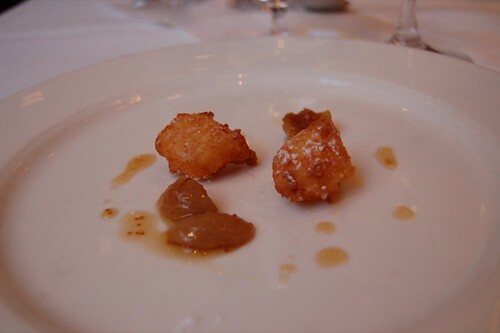 These delicate fried balls of dough and cheese were delicious, and surprisingly light. 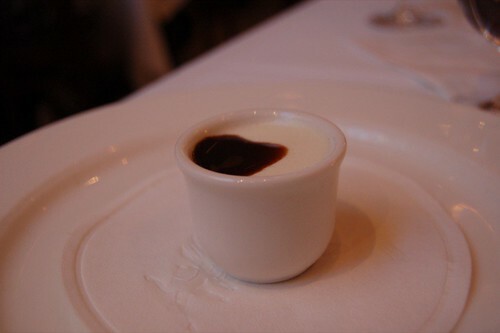 This was an interesting taste, with the milk custard perfectly balanced by the refreshing acidity of the aged balsamic. I'm usually weary of chocolate desserts, but this one was standout. 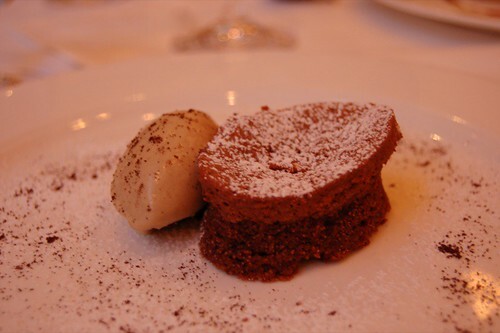 The cake had a very textured crust supporting an airy, ethereal molten chocolate center. The espresso gelato was excellent: strong and bitter, with an abundance of ground coffee bean bits sprinkled throughout. The basil gelato was surprisingly subdued - it tasted like a rich vanilla ice cream, minus the vanilla. Once again, the gelato was the standout here - smooth and creamy, with a slight hint of gassiness. 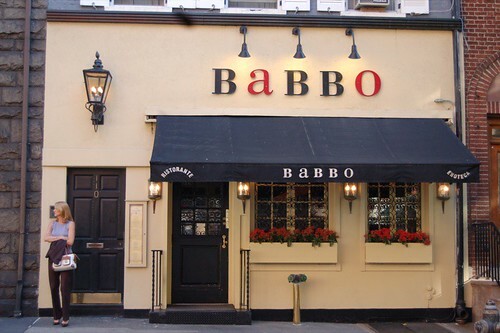 Babbo was good, but not deserving of all the hype. Perhaps it was an off-night for the kitchen, but the pastas just missed the mark. The meal grew repetitive after a few courses, as the flavors from dish to dish were not distinctly different from each other. Service was friendly, but I couldn't get over the sense of being rushed, as they presented our next course immediately after they cleared our table. I'm not quite sure what draws so many people here, but there are less fussy places out there with better pasta. I don't even know where to begin. I am back at school, after my incredible summer in New York. Soon after finals, I embarked to the city, and spent the following ten weeks at my investment banking internship. It was one of the most intense experiences of my life, but I could not have asked for a more rewarding and amazing summer. I even found time to try all the restaurants on my list (mainly by eating late and being spontaneous). Thanks to those who left comments and kept checking back - I'm excited to post frequently again. I have a huge backlog of NYC restaurants, but I will start off by ending a San Francisco post I had meant to post at the beginning of the summer. Ame, owned and operated by chefs Hiro Sone and Lissa Doumani of Terra in St. Helena, was one of the most anticipated restaurant openings in late 2005. Featuring a sleek interior and a Japanese - French menu similar to Terra, it had a lot to live up to, and has since garnered mixed reviews. For the last day of my internship last year, several of us came to ame for a last hurrah. 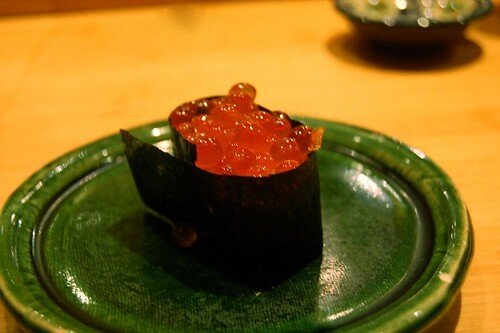 Maguro is wrapped in seaweed, lightly battered, and flash-deep fried in this simple but well-executed appetizer. 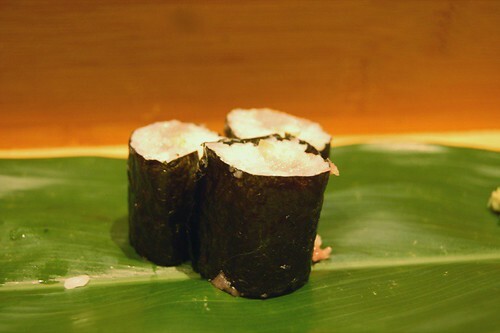 The tuna was fresh and melt-in-your mouth, while the seaweed remained crispy in its delicately crunchy tempura batter. While the ceviche was masterfully constructed, it looked better than it tasted. 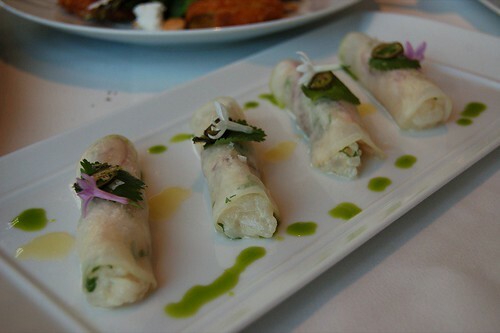 White fish is wrapped in a paper-thin radish wrap, topped off with parsley, sea salt, and candied jalapenos. The ceviche itself was a bit bland, but I really enjoyed the jalapenos, which were slightly sweet and crunchy. I just wish that the ceviche would have been more seasoned. A standard but solid salad. 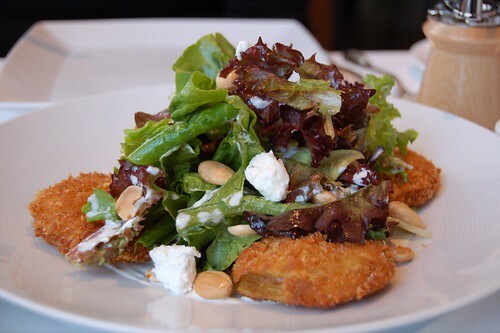 I enjoyed the fresh mesclun greens and cheese, and the green tomatoes were juicy and only lightly deep-fried. 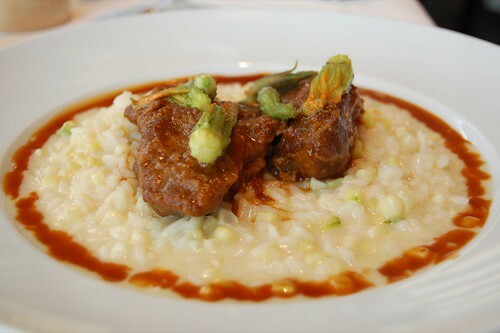 I had only tried a bit of this from K, but I found it to be a pretty standard braised meat entree. The beef was tender, but a bit over-seasoned. I also found the polenta to be too watery and overcooked. The ravioli was good - pasta al dente and the cheese not overpowering. 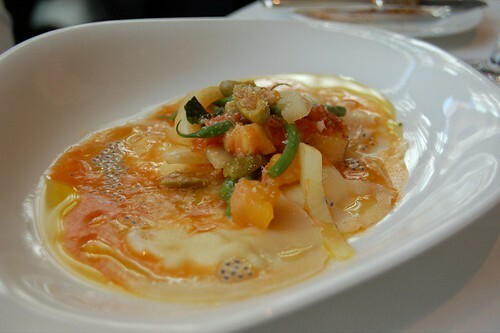 I found the accompaniments (basil seeds, crunchy haricots verts) more interesting than the actual ravioli. I ordered the signature entree. 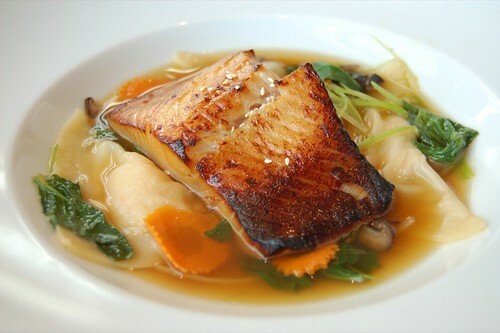 With the oversupply of fusion restaurants in the past years, the broiled cod with miso thing has been done time and time again; and with this abundance, it has become ironically difficult to find a restaurant that does it well. 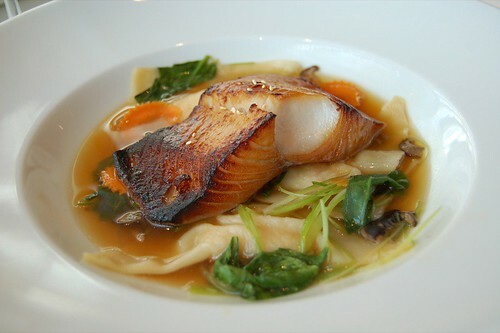 Having tried the signature cod at Nobu as well, I decided that ame's version wins hands down. 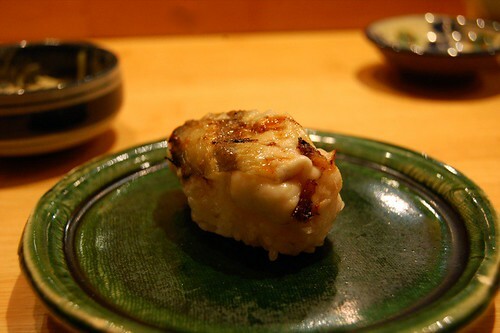 While ame's was slightly overseasoned, the texture of the fish compensated. 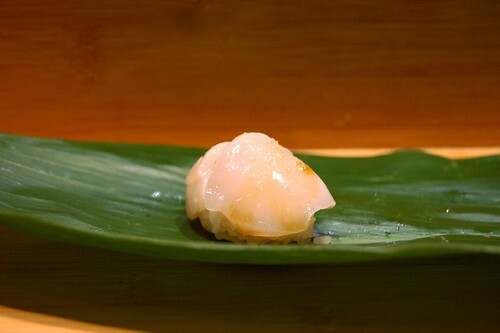 Perfectly cooked, it was nearly flaky, with the flesh being delicate and smooth. I was not too blown away by the dumplings, however. They were well-accented by the shisho broth, but the dumpling filler was lacking in depth of flavor. 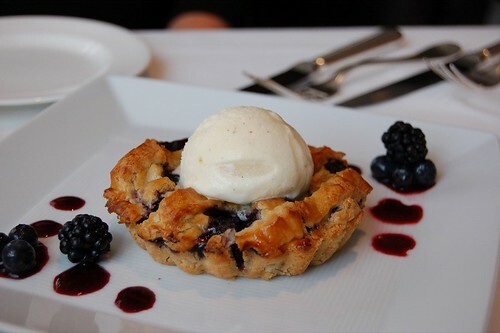 A solid blueberry pie, but I would have preferred a flakier crust. 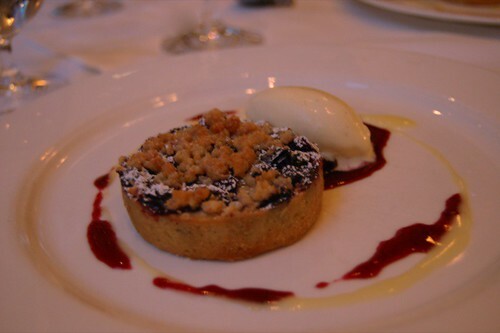 The crust here resembled the texture of shortbread, and was too dense for my liking. The blueberry filling was good - not artificially sweetened in any way. 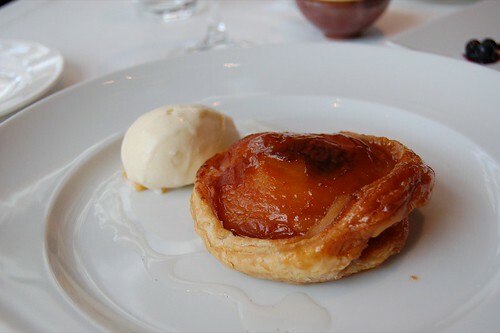 The glazed pear tart was also good, but nothing standout. Ames strengths are in its appetizers, with the exception of the cod. It is an extremely elegant fusion restaurant: nothing over the top in what I would consider "subtle fusion" (no eel sauce drizzled over everything). 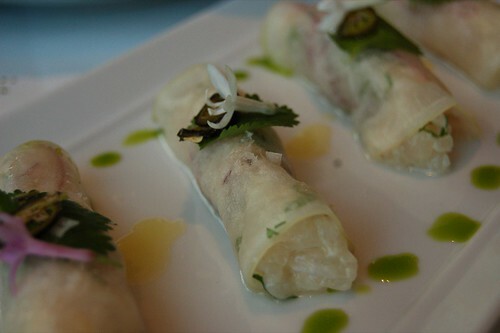 The French and Japanese influences are well-executed in its dishes, and everything works well together. I would have just preferred more flavor in certain appetizers and more innovative desserts.